Here is the package of water decals as they arrived. They were folded in the package, but carefully along the unused area so as not to effect or ruin any of the decals. They were in a sealed plastic bag, and had a clear over sheet to protect the water decals themselves before sale. There is one pink/ red, one blue/ purple, and one yellow/ orange themed blocks which means lots and lots of combo options!! This is just a little close up for you of each panel. 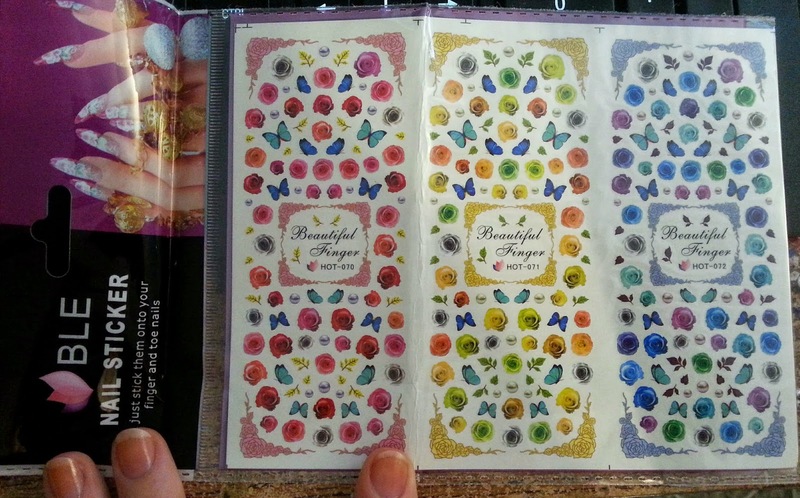 As you can see there are also pretty little Leaf, and Pearl decals to accent the Flowers and Butterflies. You will definitely need a small pair of scissors to cut each decal out, but a nice pair of cuticle scissors works extremely well if you have them. Just in case you are unfamiliar with water decals they kind of work like temporary tattoos. You simply cut out which image you want, dip it into water for 10-15 seconds and then the image slides off the backing. You can then affix the image to the desired area of the nail. All you need to do after that is dry off any excess water and apply top coat. You can even use a hair dryer to make sure they are affixed into place quicker. These did dry into place on their own however as they sat on the nail longer. Lastly here is my complete manicure using these pretty flower and butterfly water decals :) I love it so much!! I did a color gradient base so that I could match some flowers from every panel to my nails to illustrate how you can combine them and how they look in all colors. 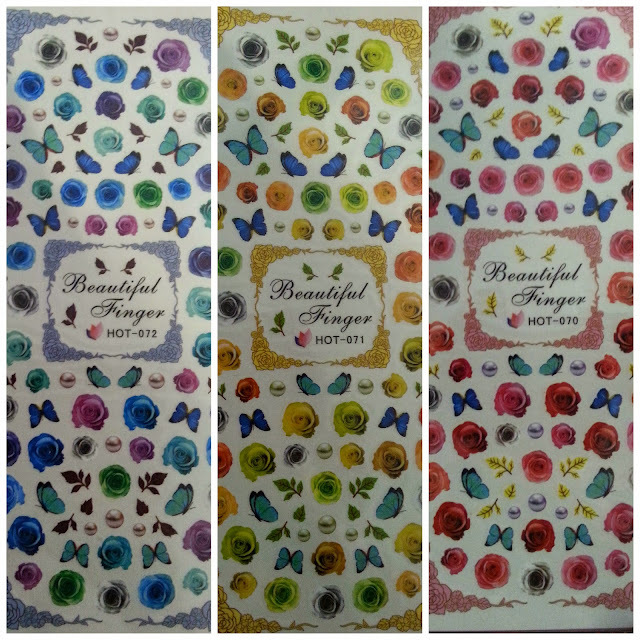 I am extremely satisfied with these water decals. They are so beautiful and they are extremely easy to apply. They are excellent for giving you a super fancy look in under 10 minutes for those times when you want banging nails but are short on time. The best part is that not only are they beautiful, they are extremely affordable. 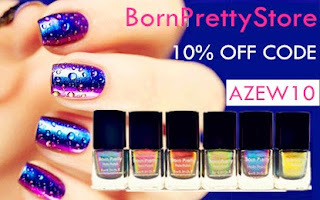 You can get them on the Born Pretty Store website for only $3.39!! That's not all though! If you use my discount code from the image below (AZEW10) you can get 10% off your entire order. So what do you think guys? 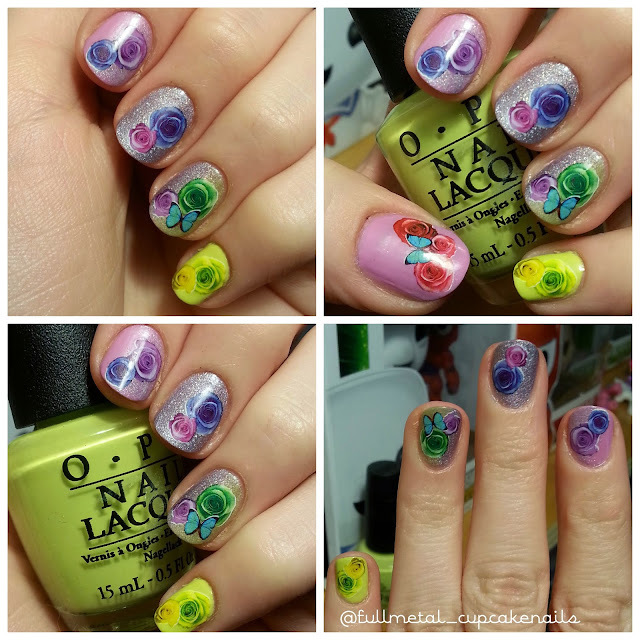 Let me know in the comments below what your opinions are on water decals. I love them now :) Thanks for dropping by guys and don't forget to check out Born Pretty Store for tons of nail art and beauty supplies at a very affordable price for us fabulous people on a budget.